Along the lines of creating your project, you should know it’s not only what is on the outside that counts, but also on the inside. Space planning and interior design should not be an afterthought but be directly up there in the highest goals of how you want your finished building to look. With Watkins Architect we can make sure it is stylish while also providing efficiency in the workplace and community. Before you hop right into the interior design and try to figure out what works with what, the first part of the process starts with mapping out the layout of the inner parts of the building. You should figure out a layout that will not only work for you but for all coworkers and employees who will be spending time in the building daily. There are cubicles, group desks, meeting rooms, lounges, break areas, etc. Depending on how your building operates and runs will affect the end result of the layout. 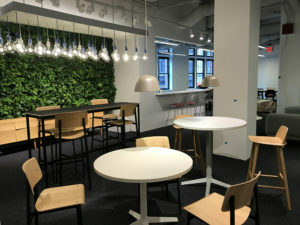 An improved layout could mean a dramatic increase in the efficiency, mood, and productivity of your workers – such as the design services Watkins Architect is providing for Knoll! The Knoll Boston Showroom already has 12,000 square feet space, but was requiring a refresh. The show is on the road, and from the original space that was designed in 2010, progress and construction of the renovation are currently taking place! Not only do what rooms you need matter, but also what furniture, can take space away which will affect how you think about your space planning. Creating a layout and plan can make interior design much more efficient and productive! For your planning and constructing needs, you can contact Watkins Architect for help with your layout to find out what works for you and to make that layout come true!